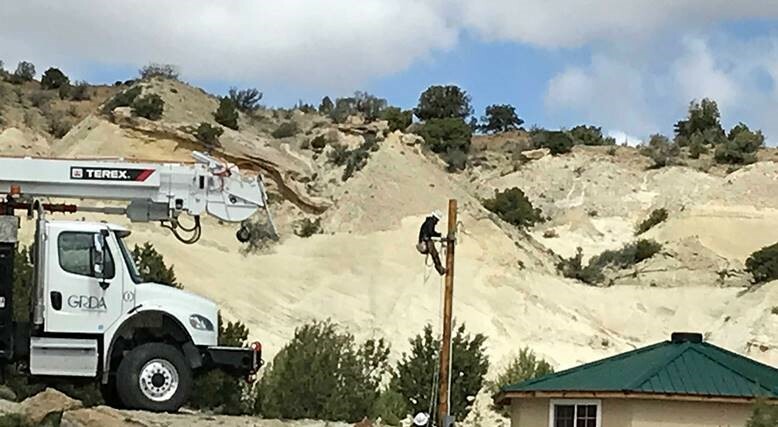 Thanks to the efforts of the nation’s public power utilities, including the Grand River Dam Authority, thousands of homes on the Navajo Reservation in Arizona are set to receive electricity service for the first time. GRDA Linemen Ben Curnutt prepares an electric distribution pole for connection to the power line, on the Navajo Reservation near Chinle, Arizona. Curnutt was one of nine GRDA employees to participate in the “Light up the Navajo Nation” initiative coordinated by the American Public Power Association (APPA) and the Navajo Tribal Utility Authority (NTUA). During its stay in Arizona, GRDA’s team helped bring electric service to 20 homes that have never been powered before. (photo courtesy of APPA). Public Power Association (APPA). 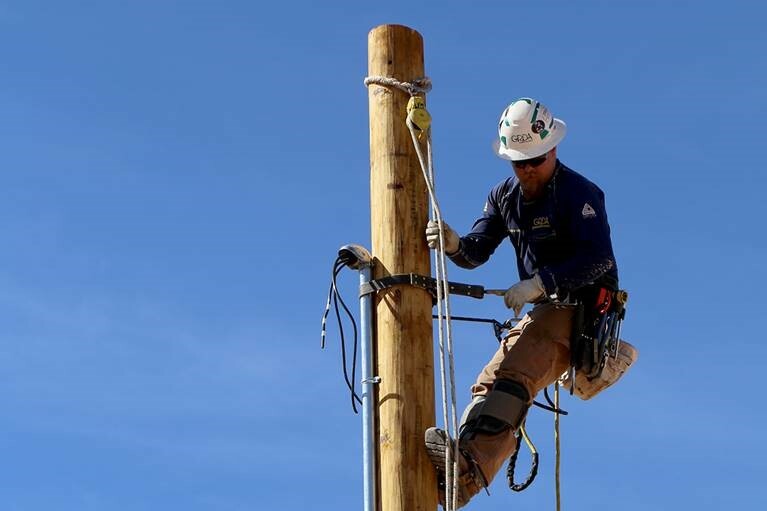 The “Light up the Navajo Nation” project’s goal is to bring together more than 100 volunteers from 24 public power utilities to build electric distribution infrastructure across the 27,000 square mile reservation. Of the 55,000 homes located on the reservation, as many as 15,000 do not have electricity. In fact, these homes make up a full 75 percent of all un-electrified households in the United States. During its time on the reservation, the GRDA team split into two separate crews, each working 12 hour days for five days straight, to bring power to 20 homes for the first time. 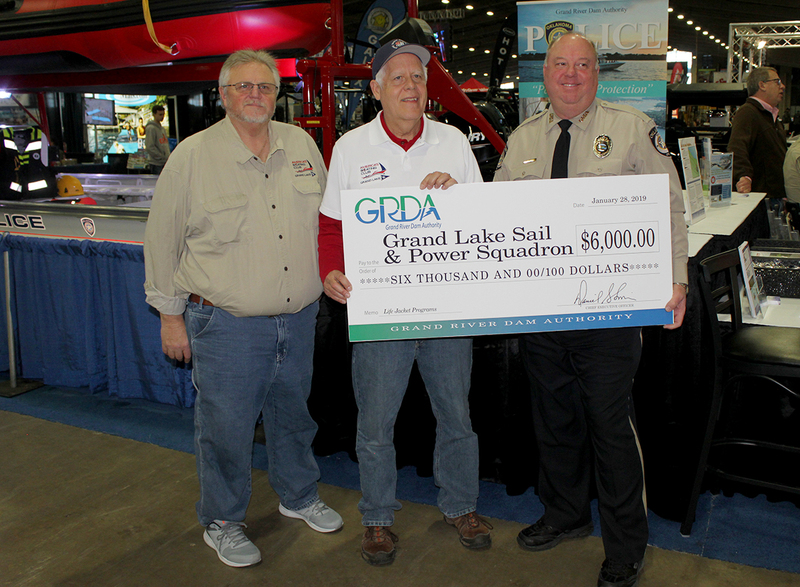 Of course, GRDA is no stranger to providing mutual aid to neighbors in need. However, past work has always been done to help another utility restore its system following an ice storm, tornado or hurricane. 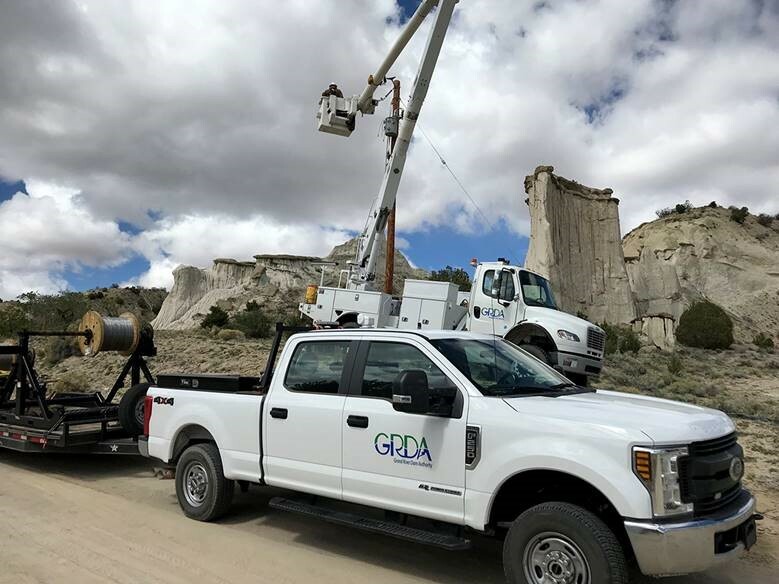 The “Light up the Navajo Nation” project is the first time GRDA has provided assistance for a new electrification project. Because of the unique nature of this project, the GRDA linemen who participated say it is an experience they will never forget. Another GRDA lineman, Steven Willis, shared about the positive impact electricity would have on a family that would no longer need to refrigerate their child’s medicine at a relative’s home. “The look on this father’s face when he said “I can put the medicine in my own refrigerator now’ will stick with me from now on,” said Willis. Echoing Willis’ comments, lineman Brent Scott also shared about the impact electricity was having on another resident’s efforts to warm her home. “There was an elderly lady, a retired school teacher, who had moved back to the reservation after retirement and lived alone. She had been hauling wood for fuel to keep her warm,” said Scott, adding that an electric heater was now going to make life much easier for her. Although they battled some difficult terrain, dust storms, high winds, cold weather and even a bit of snow, David Hefner, who served as the GRDA lead in Arizona, called the week of long hours and difficult work a great experience. Headquartered in Washington, D.C., APPA is the national association for the nation’s 2,000 not-for-profit, community-owned electric utilities and represents public power before the federal government. Collectively, these utilities serve 49 million people across the United States. Headquartered in Vinita, GRDA is Oklahoma’s state-owned electric utility; fully funded by revenues from electric and water sales instead of taxes. Each day, GRDA strives to be an “Oklahoma agency of excellence” by focusing on the 5 E’s: employees, electricity, economic development, environmental stewardship and efficiency. GRDA Linemen at work on the Navajo Reservation in Arizona in early April. GRDA was one of 20-plus public power utilities to participate in the “Light up the Navajo Nation” initiative coordinated by the American Public Power Association (APPA) and the Navajo Tribal Utility Authority (NTUA). 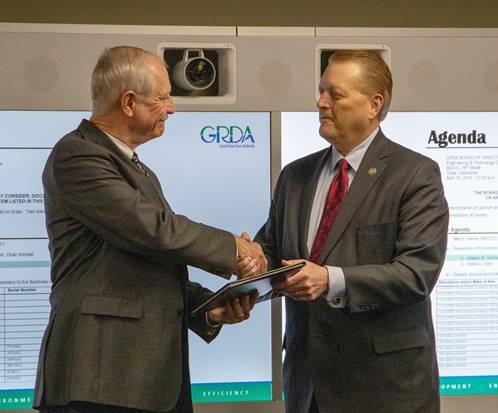 GRDA President/CEO Dan Sullivan (right) presents a retirement resolution to GRDA Vice President of Engineering, System Operations and Reliability Mike Herron during the April 18 meeting of the GRDA Board of Directors, in Tulsa. Also at the meeting, GRDA announced it will be naming a substation, located in the MidAmerica Industrial Park, in honor of Herron, who retires May 1. Herron is a 15-year GRDA veteran but his career in electrical engineering and public power spans nearly five decades. Operations and Reliability Mike Herron. Herron, who officially retires on May 1, learned of his namesake substation during the April 18 meeting of the GRDA Board of Directors. GRDA President/CEO Dan Sullivan told Herron that the substation, formerly known as the “3500 West Main Substation” will now be GRDA’s “William M. Herron” substation. Earlier in the month, Herron, who joined GRDA as Chief Engineer in 2004, was also presented with the Municipal Electric Systems of Oklahoma (MESO) 2019 Pruett-Lamb Lifetime Achievement Award during MESO’s annual Oklahoma Public Power Conference. That award is given annually to an Oklahoma public power professional who has contributed to the growth of their organization and/or the state’s public power community over the lifetime of their professional career. His career as an electrical engineer spans nearly five decades. The last 29 years were spent in Oklahoma, first with the City of Stillwater (one of the state’s largest public power utilities) before his GRDA tenure began. At that time, he was already recognized as one of the Midwest’s leading experts on electric distribution design. Always an advocate for public power and electric reliability, Herron has overseen many upgrade projects to the GRDA electrical transmission system during his 15-year GRDA career. A new documentary, detailing the importance of the Grand and Illinois River watersheds, is scheduled for a public viewing on March 25th. Entitled Our Borrowed Water, the film takes a closer look at some of the issues surrounding these waters while also illustrating their value through the eyes of those who depend on them for work and play. The film does all of this against a backdrop of stunning visuals along Grand Lake and the Illinois River. The Grand River Dam Authority contracted with 1577 Productions to produce the documentary, which features an intro from GRDA President/CEO Dan Sullivan, as well as interviews with GRDA Vice President of Ecosystems and Watershed Management Dr. Darrell Townsend and GRDA Vice President of Scenic Rivers Operations and Water Quality Ed Fite. Others featured in the film include Illinois River Watershed Partnership Executive Director Nicole Hardiman, OKC Kayak’s Dave Lindo and avid Illinois River fly fisherman Chris Castro. The first public premier of Our Borrowed Water was originally scheduled for February 19 at the GRDA Ecosystems and Education Center, but was postponed due to winter weather. The film will now be shown on Monday, March 25th at 6:30 PM inside the Grand Hall at the GRDA Ecosystems and Education Center in Langley. The event is free and open to the public. Following the premiere, there will also be time for a short Q&A session about the film. Please be advised Grand River Dam Authority is proposing changes to its Lake Rules.